MULTIPLE OFFERS! Please get offers in by end of day Sunday. Seller will review & respond Monday. FULLY UPDATED! This 3 bedroom, 1.5 bathroom home has been fully updated inside & out. 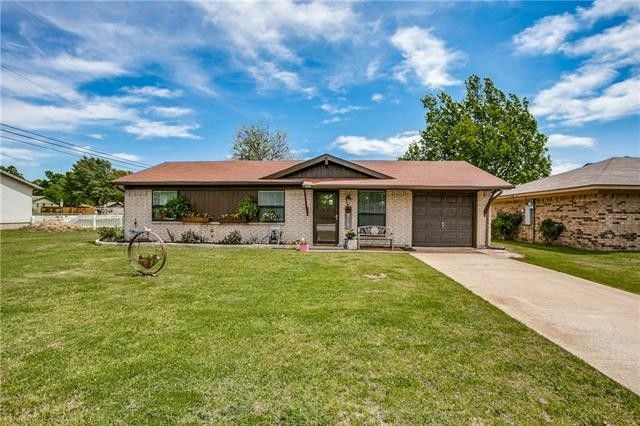 Charming home boasts wood-look laminate and ceramic tile flooring throughout. Separate utility room for full-size washer & dryer. Newer roof, windows, lighting and ceiling fans, kitchen appliances, storm door, and electrical panel. Don't miss large rear patio in the oversized backyard where there is a great shed to compliment the single car garage leaving plenty of room for vehicles AND storage. Minutes from downtown Wylie, with easy access to shopping, dining & parks and just a short drive to Lake Lavon. Schedule a showing today! Directions: From HW 78, East on 544, right on Hilltop, the house is on the left. Exclusions: Exclude circle flower stand in the front yard.